Jasmine Yvette Ruiz was born on July 3, 1994, as happy and healthy as you could ever dream. 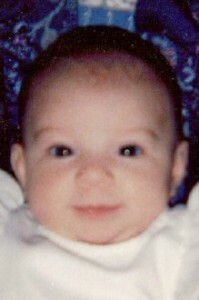 She was always cooing and smiling, and even starting to giggle when she fell victim to SIDS on September 22, 1994. We were at home and she was in her crib, when her father went to get her for our morning family time. As I sat waiting on the bedside, I heard him scream to me from down the hall. My first thought was that she had been kidnapped. As I ran down the hall, I saw her in his arms as he yelled “She’s choking!” Being in healthcare all my life, one glance told me clinically she was dead, but the mother in me said “No way.” I grabbed her from him and dropped to my knees and began CPR. She was already gone, but some how God was going to make this right and bring her back. As her father called 911, my 2 1/2 year old son came and knelt next to me, picked up his sisters flaccid arm, and asked, “Momma why not sister waka up?” My attention was drawn to his big green eyes, and I screamed to God that no, this is not happening. I yelled for his father to take him outside to wait for the fire department. As they pulled up, it seemed like forever. But color began to even out, and the blood pooling discoloration on her face was dissipating. The smell of her baby breath is with me to this day. We ended up at the hospital, where I was praying that God saved some miracle treatment for special cases like this, but I just didn’t know about them. Well, on that day I found out it was just regular medicine, regular doctors. There were no special tricks, and God could do nothing to give her back to me. As I sat and rocked her in the trauma room after they declared her DOA, I saw her start to breath again and swore to the nurses she was still alive and I can take her home now. All my family members that showed up at the hospital had to drag me out, as I was becoming psychotic. Then the detectives came, asking questions that made me feel as though we did something wrong because we put our baby to sleep and she didn’t wake up. They focused more on her father than me, but it was a very hard time made much worse by having to deal with the thought of being in trouble for something we couldn’t control.